Have you ever noticed how congestion builds on the motorway for no apparent reason? Every motorist can relate to seeing miles and miles of traffic suddenly clear when they get to the front of the queue, with no sign of an incident causing the build-up. But what causes these 'phantom' traffic jams? Often, the cause is a chain reaction, triggered by someone hitting the brakes. If your brake lights illuminate on the motorway, even for a brief moment, it can cause the driver behind to also apply their brakes. This passes along the queue of traffic, with the brake action getting ever-so-slightly longer as it passes through each car. Eventually, it can lead to cars coming to a standstill. A group of Japanese researchers demonstrated this in a simple circular demonstration: the video is a fascinating visual insight into how phantom traffic jams occur. The same scenario can be triggered by someone changing lane unexpectedly. Dr Eddie Wilson from the University of Bristol has previously carried out research which showed that, under the right conditions, one motorist's bad driving can create “a traffic tsunami which can affect traffic up to 50 miles away”. Analysing driver behaviour on a 10-mile section of the M42 motorway in the West Midlands, Wilson and his team of mathematicians discovered that sharp braking, unnecessary lane changes and lorries slowly overtaking each other were a more significant cause of congestion than crashes. How should you use your brakes on the motorway? So how do we prevent this congestion caused by braking? The simple answer is to use the brakes less, when appropriate. Of course, safety must always come first. There are times when it’s absolutely necessary to apply the brakes and, in these situations, reducing congestion should be the last thing on your mind. Advanced drivers look further up the motorway, spotting situations that might require them to slow down and merely lifting off the accelerator to slow down – gradually using engine braking – rather than applying the brakes. If traffic is flowing freely, you shouldn’t need to brake at all on the motorway until you turn off on a slip road. Besides, using your brakes less is good driving practice. Not only could it reduce congestion, it will also improve fuel economy, cut exhaust emissions and make for safer driving. Avoiding causing other motorists to brake is important, too: resist changing lanes if it’s going to have a knock-on effect for other cars. 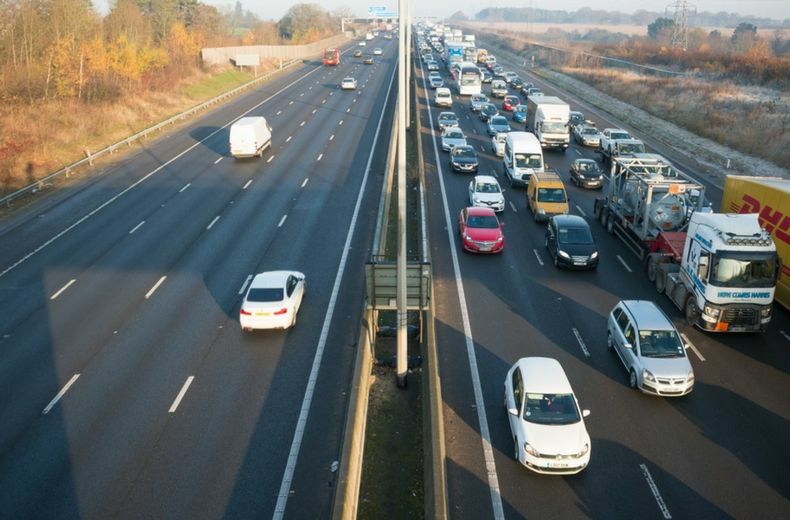 How do smart motorways help congestion from braking? Smart motorways are designed to reduce congestion by actively responding to the theories behind phantom jams and unnecessary braking. Cameras monitor the flow of traffic and, if they detect slowing movement, a lower speed limit can automatically be enforced by variable speed cameras further back along the motorway. By lowering the limit, this lessens the ‘wave’ effect of brake lights as it gradually reduces the average speed and gives congestion a chance to ease. There’s less panic braking, motorists have more time to react to the actions of others, and everything moves more smoothly with less likelihood of things grinding to a halt. Therefore, by sticking to the speed limits imposed by the signs on overhead gantries, motorists may well be saving themselves time in the long run. Another preventable cause of congestion on motorways is ‘rubbernecking’. This happens when traffic driving past a crash in the opposite direction slows down for a look. As well as being dangerous (being distracted could cause another crash), it also creates congestion as the traffic slows down. A government-sponsored study of accidents and breakdowns on a stretch of the M6 motorway in the UK discovered that, during a 15-hour period, 29 percent of crashes caused rubbernecking by drivers on the opposite carriageway. Screens have been developed to hide severe crashes from passing motorists in the UK, but data revealed as part of a Freedom of Information investigation in 2015 shows that, during the two years before that, they were only used on motorways 18 times. That’s despite the fences costing Highways England £2.2 million. In an investigation into congestion and unreliability on the road network, Transport for London (TfL) identified seven defining factors: traffic incidents, roadworks, the weather, fluctuations in traffic levels, special events, traffic control devices and physical bottlenecks. TfL found that weather can be a "root cause of congestion", producing unreliable travel times, because the conditions are never the same from day-to-day. Certain conditions can lead to changes in driver behaviour that affect traffic flow. For example, rain or fog will increase journey times, while the rising or setting sun can dazzle drivers, causing them to slow down, which increases the chances of congestion.